We had reported about MTNL Delhi introducing the ‘All-In-1-Paisa’ plan in July for a limited period and now MTNL has decided to regularize the plan. If you are buying a new connection you have to go for the Rs. 97 FRC which will include a 3G Sim-card with 1 year validity and all outgoing calls to all networks would be at 1p/sec for a year. Incoming and outgoing calls while roaming will also be charged at 1p/sec. It you are already an existing subscriber you can go for the Rs. 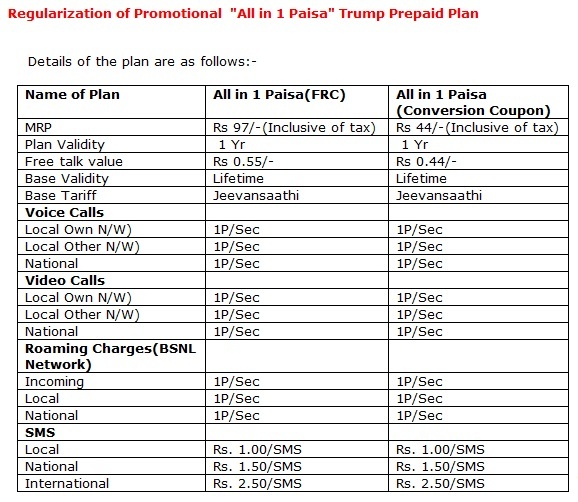 44 conversion coupon which will change your existing plan to ‘All-in-1-Paisa’ plan for 1 year.